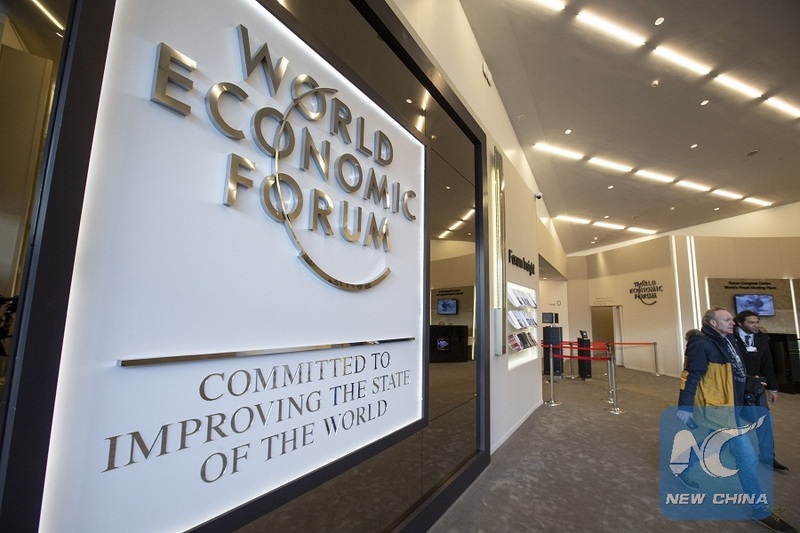 DAVOS, Switzerland, Jan. 22 (Xinhua) -- World leaders and business elites gathered on Tuesday in Davos to discuss globalization 4.0, a buzzword that means a new wave of globalization in a digital world. More than 3,000 participants braved the winter chills and icy roads to the snow-covered Swiss resort for the World Economic Forum (WEF) annual meeting, a leading platform for global economic affairs. More than 60 heads of state or government, 40 international organization heads and 1,700 business leaders will attend this year's event that runs through Friday, themed Globalization 4.0: Shaping a Global Architecture in the Age of the Fourth Industrial Revolution. Addressing the opening ceremony, WEF Founder and Executive Chairman Klaus Schwab said participants at the meeting will have to look at all the global challenges and shape the future of the world over the next four days. In an increasingly interconnected world, globalization 4.0 has to be human-centered, more inclusive, and more sustainable, Schwab said, adding that much emphasis was put on environmental issues at the forum. In an article published on the U.S. magazine Foreign Affairs, Schwab wrote, like its predecessors, the Fourth Industrial Revolution is best described by its leading technologies: artificial intelligence, autonomous vehicles, and the Internet of Things. " "In this world, globalization won't disappear; it will deepen. If in the past global integration grew as trade barriers came down, it will now rely on the connectivity of national digital and virtual systems and the related flow of ideas and services. This is the core of Globalization 4.0," he wrote. This year's event came as risks hang over global growth, with rising nationalism, and protectionism, and political uncertainties in rich countries. U.S. President Donald Trump, British Prime Minister Theresa May and French President Emmanuel Macron are absent from the forum due to their domestic difficulties. In a report released before the annual meeting, the WEF said that rising geopolitical and geo-economic tensions are the most urgent risk in 2019, with experts predicting further economic confrontation between major powers in 2019 and erosion of multilateral trading rules and agreements. Reflecting on the troubling status quo of globalization, China's stance on globalization will be worth attention, analysts said. Chinese President Xi Jinping said in Davos in 2017 that the global economy is "the big ocean that you cannot escape from" and any attempt to retreat back to isolation runs counter to the historical trend. One major solution offered by China to help tackle global challenges and build an open and more inclusive economy is the Belt and Road Initiative, said Martin Albrow, a renowned sociologist and a pioneer of the theory of globalization.